Tires do a lot of key work for Little Rock motorists. They transfer engine power and braking forces to the road; they handle steering control; and they cushion all those bumps and jolts while driving around Little Rock. They also support the entire weight of the vehicle, including you and your passengers. With such critical work to do, you want your tires to do their job well. And since replacing tires is fairly pricey, you want them to last as long as possible. Also, there are different rotation patterns for different vehicles. Parkway Automotive will know which is right for your vehicle. That brings us to wheel balancing. When wheels are balanced, they spin on the axle evenly. When they are out of balance, they wobble a bit. That makes the tires wear unevenly and may transmit a vibration to the car. Your honest Parkway Automotive service specialist puts weights on your wheels to balance them out so that they turn true and smooth. Tires are a big investment for Little Rock auto owners. They’re key for keeping you safely on the road in Little Rock. The cost for regular rotation and balancing is more than made up in extended tire life. And, can you really put a price on your safety and that of your passengers? A lot of people get custom wheels in Little Rock. When you do this yourself (over the internet . . .) you could run into trouble if you’re not careful. Sometimes, once they’re mounted, they just don’t fit right. The tires rub in turns or on bumps. You don’t want that. Consulting your Parkway Automotive tire professional can ensure you get the right fit. First he’ll ask you a series of questions about your Little Rock driving needs and what you want in your new wheels. Now, not every wheel can go on every car. Care must be taken so that tires and wheels are not too large or that the wheel is centered too far towards the outside or the inside so the tires rub. If you don’t want to make any modifications to your truck, you would need to focus on the wheels that would fit. With trucks, some Little Rock people like much bigger tires so they need a suspension lift. Also, most Little Rock drivers don’t realize that you need to keep the rolling diameter of your new tires – that’s, like the overall height of the tire – very close to what came from the factory in order for your truck anti-lock brakes and stability control systems to work properly. The computers that control these systems are calibrated to a certain size tire. When you go bigger or smaller, the computer doesn’t know what changes you made so it can’t tell how fast you’re going. This, of course, means it sends commands to the brakes and traction control that are based on the wrong speed. If you go with a different rolling diameter, your truck engine control computer can be reprogrammed for the new tire size. Either way, there are hundreds of wheel and tire choices to choose from in Arkansas. 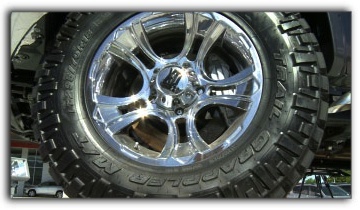 You can pick the style of wheel you want and then talk with your honest Parkway Automotive tire professional about how big the wheel should be – and how to select the right tire for your truck. Your Parkway Automotive service advisor will help you find the best tire to meet your style, performance, ride and handling needs in Little Rock. When winter approaches in Little Rock Arkansas, we break out the sweaters, coats, boots and mittens. We want to be ready for winter conditions. Your vehicle needs to be ready for winter as well. The last thing you want is to get stranded out in the cold. You need your vehicle to be safe and reliable. It’s a good idea to get caught up on any neglected maintenance items anytime – but the stakes are higher in the winter. There are some specific things that we need to do in Little Rock Arkansas to have our vehicle ready for winter. The most obvious is having the antifreeze checked. If the antifreeze level is too low, it can’t properly protect your engine, radiator and hoses from freezing. If your car does not seem to be making enough heat to keep you warm, your antifreeze level may be low or you could have a thermostat problem. Get it checked out. If you are due for a cooling system service, now is a perfect time to have it done. In the cold months around Little Rock we always worry about being able to stop in time when it’s slick out. The first thing to remember is to slow down and allow yourself plenty of room to stop. Of course, you want your brakes to be working properly. A thorough brake inspection will reveal if the pads or any other parts need replacing. Check with your service consultant to see if it is time to replace your brake fluid. It accumulates water over time which really messes with your stopping power. Winter in Little Rock Arkansas always makes us think of our windshield wiper blades – usually during that first storm when they aren’t working right. That’s why it’s a really good idea to replace your blades in the fall before the winter storms. If you live where there’s a lot of snow and ice, you might want a special winter blade that resists freezing up. And be sure to have enough windshield washer fluid.